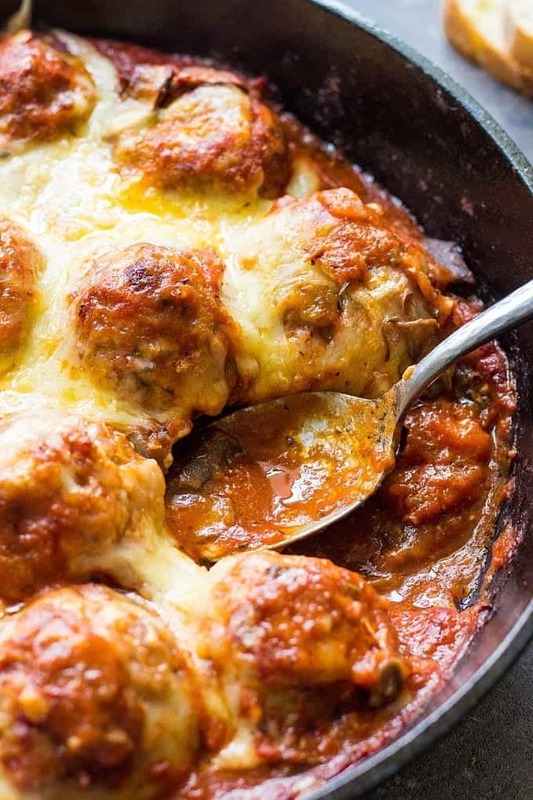 These Easy Baked Meatballs with Gruyere Fondue are a true winter comfort food. They are loaded with comforting flavors and are perfect for delicious weeknight meal for the whole family. These are the cheesiest and the yummiest! If cold winter weather makes you crave comfort food, I hear you! Cold weather means rich and hearty comfort food, can you argue with that? Friends, if you noticed, I’ve been a little absent from my blog lately. Last months we packed our Indiana apartment in boxes and moved to East Coast. It’s quite a big move, physically and emotionally stressful. And even though it’s been a month since the move, we’ve just recently finished unpacking and settling down in the new house. So, now Connecticut is officially our new state and boy, it’s a busy area. I still haven’t gotten into the swing of things and have a hard time shooting new recipes. But bare me with here. I have so many great recipe ideas for the upcoming months. You’ll see them really soon, I promise. I’ve actually made this Easy Baked Meatballs recipe awhile ago. It was not that cold yet, but I liked the idea of having meatballs with Gruyere fondue for dinner. This idea definitely was appreciated by my husband and kids who devoured the meal on a whim. These meatballs freeze well too. The recipe makes 25 small meatballs. You can either freeze them before cooking. Or fry for a few minutes on each side, cool completely and then freeze. And when you’re ready to eat, all you’ll have to do is to warm them up in a tomato sauce and top with that beautiful cheese. Yum! For the last few steps of the recipe, you need a good ovenproof skillet (like this), or braiser (like this). I made my meatballs in Lodge 10 inch cast iron skillet. I bought it just recently and it quickly became one of my favorite cooking pieces which is surprisingly quite cheap. Arrange meatballs on a prepared baking sheet and bake for about 15 minutes. Meanwhile, in a large ovenproof skillet heat olive oil. Add mushrooms and cook on a medium heat until water evaporates, about 5-7 minute. Add the remaining minced clove of garlic and cook for another minute. Stir in Marinara sauce, water and simmer for 5 minutes. 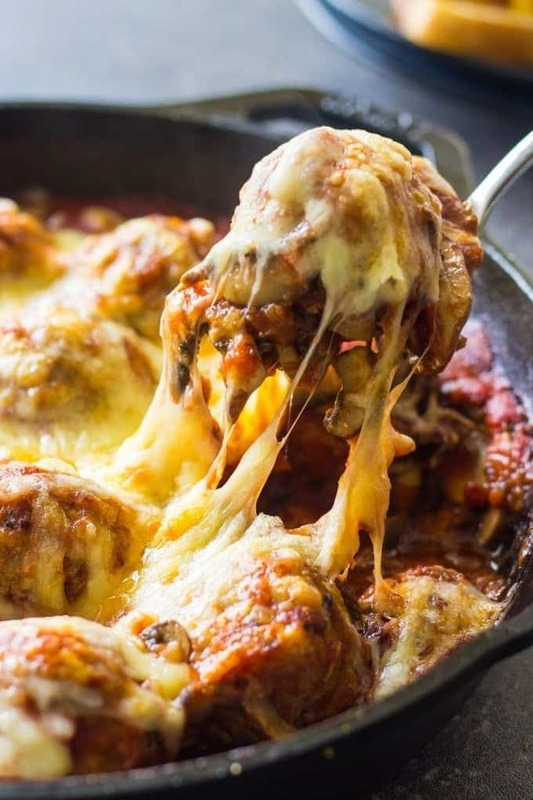 Arrange cooked meatballs in a skillet, gently coat them with the sauce and generously sprinkle with Mozzarella and Gruyere. Preheat broiler and broil meatballs until cheese melts, about 2 minutes. For this recipe I used regular breadcrumbs, but if you're on Keto or Low-Carb diet, you can definitely substitute with low carb breadcrumbs like almond flour or coconut flour. 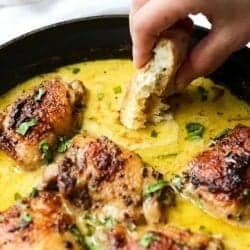 So my friends, give this recipe a try and let me know you liked it. I have no doubts, you won’t be disappointed. If you like my Easy Baked Meatballs, here’s another scrumptious dinner recipe that I promise you’ll love. Meatballs AND fondue?! Stop right there, I’m sold. This sounds so savory and comforting and fabulous! MMMM. Great comfort food. I just love Gruyere- so rich and flavorful. I can’t wait to try this recipe. That cheese… oh my gosh! This looks fantastic! Holy moly! Totally drooling! This would be a yummy game day appetizer. I’ll be sharing this on my Facebook page for sure!